Used Audi A4 Review - 1995-2001 | What Car? 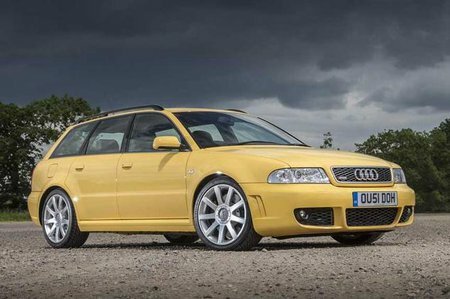 The interior of the original Audi A4 Avant is built like a bank vault, so even high-mileage cars should be free from rattles and squeaks. Like the saloon, this A4 Avant kick-started Audi's renaissance as interior design masters. The materials are classy and the styling is measured, understated cool. Space in the back is meagre, but at least the ride is comfortable on most surfaces and you won't hear much outside din as you're whisked along at speed. The engines are smooth and hushed until near the red line, but since most of them give strong mid-range shove, you don't need to go there. Handling? It's okay - the four-wheel-drive quattro models are better - but it's no BMW 3 Series Touring. The brakes can bite a bit too sharply, too. Luggage space isn't generous, but the A4 Avant is more extended hatchback than estate, and the rear seats will fold so you can do the dump trip in one hit.